The River Moyka in St. Petersburg begins from Fontanka at the Summer Garden and runs into Big Neva near its entry. If you go along Nevsky Avenue from Admiralteystvo , then Moika – is the first of the rivers crossing the avenue. River extent - 4, 57 km, depth reaches 3 m, and width – 40 m.
The ancient name of the river – is M'ya, coming from Finnish "muyu" translated as "mud". According to one of versions it was named Moyka for the reason that in those old times on its coast there were several public baths. Each house on the embankment will tell us about a history of the city, but its top part is especially beautiful. It is one of amazing places of St. Petersburg and promenade on the embankment will be interesting for guests of the Northern Capital. There are historical buildings and quiet calm corners – the Summer Garden, the Field of Mars and Mikhailovsky Garden. From the embankment at Pevcheskij Bridge there is a special view of the Palace Square, at Potseluev Bridge - of St. Isaac Cathedral. And indeed the bridges are personally the sights of St. Petersburg. The territory in this area always was very expensive and only moneyed people could build houses here. Historical landmarks decorating the embankment: Yusupovskij Palace, Stroganov Palace and the palace of Razumoskyi. Mansions and the former tenement buildings embellish the embankment. In the borderland between embankment and Nevsky Avenue on the left coast was built the palace for the count Stroganov by the architect Rastrelli in 1752-1754. The building in style of the High Baroque is decorated with columns and medallions with a men's profile. It is recognized that the sculpture represents the count Sergey Grigoryevich Stroganov, but anecdotal evidence suggests that it is Francesco Rastrelli's profile. At the close of 18th century the reconstruction of a palace was carried out. The former bondman Andrey Voronikhin took part in this reconstruction. By hearsay, Andrey Voronikhin, after in years the architect of Kazan Cathedral was the base son of Stroganov. Their joint trips abroad, promotion of architectural orders of Voronikhin and patronage of the count confirm this fact. Sergey Stroganov was one of the wealthiest people in Russia and he arranged open lunches in the yard of his Palace. Any decently dressed Petersburger could freely enter a court yard and take a dinner. And now there is a cafe in this yard where it is possible to see the guests of St. Petersburg. A.S. Pushkin and M.E. Saltykov-Shchedrin, K.F. Ryleyev and M.Yu. Lermontov lived on Moyka Embankment. A.S. Pushkin lived the last months of his life in the house No. 12 together with his family and the wife's sisters Aleksandra and Ekaterina Goncharovy. From this place on 27-th of January, 1837 he went to a duel with Dantes and here it was brought fatally wounded, and on 29 -th of January at 2 hours 45 minutes A.S. Pushkin died being in this apartment. On 10-th of February, 2012 there was 175 years from the death-day of a great poet. In the yard there is a bronze monument devoted to A.S. Pushkin that was executed by the sculptor Nikolay Dadykin in 1950. In total there are 15 bridges thrown through the River Moyka. The bridge that is very first from an issue, – is the First Engineers' Bridge, constructed on the place of wooden Letny Bridge and connecting the Summer Garden and the Spassky island. He received its name according to the neighbored Mikhailovsky Engineers' Castle. Nearby on Fontanka Embankment at Pantelejmonovskij Bridge it is possible to see a monument devoted to the Finch-fawn (Chizhyk-Pyzhik) to which tourists throw coins for luck. Downstream from the River Moyka there is Lebyazh’ya groove burrowed in 1711. It connected Neva and Moyka. 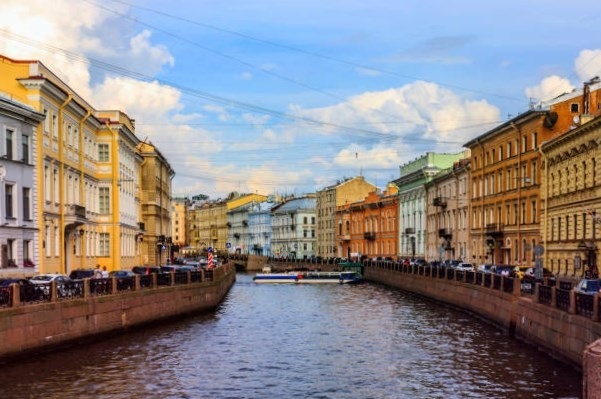 The channel divides the Summer Garden and the Field of Mars and has a length of 648 m.
At the beginning of the 19th century many wooden bridges in St. Petersburg were reconstructed on stone and metal. The idea to create the Trojnoj Bridge belongs to K. Rossi, and the architect E.A. Adam developed the project of the new original three-humpback bridge. In one bearing they connected Malo-Konyushennyj Bridge through Moyka River, Pervokonyushennyj (Teatral'nyj) Bridge through the Griboyedov Canal and Suhoputnyj сauseway sometimes called as Lzhe Bridge. Trojnoj or Trekharkovyj Bridge is the purlieu of a newly married couples, as well as the Bronze Horseman, the Spit of Vasilyevsky Island and Potseluev Bridge. Newly married have to pass by both parts of the bridge and look at their reflection in water. In the 18th century down the bridge line passed a city border and therefore people kissed and took leave in this place. Near a ferriage there was a guard’s naval barracks and on the bridge seamen took leave with their dears. There is a legend that on a bridge met the lovers who had to hide their feelings. The truth occasion of the name is the surname of merchant Potseluyev and his tavern named Kiss ("Potseluj ") that was located at the corner of Glinka Street which serves as an extension to the bridge.